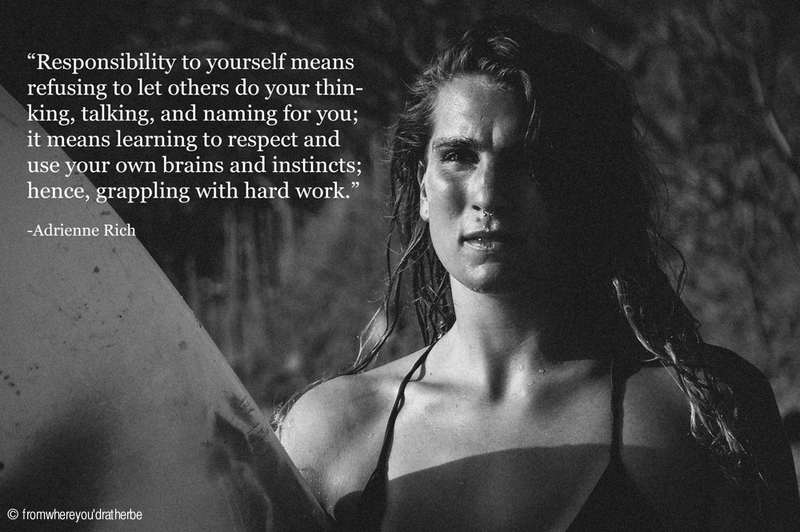 From where you'd rather be - by Ale Romo: Monday quote, being a fully responsible woman! This Monday I decided to use a very strong image for illustrate a very strong thought about being a responsible woman. Some of us we are just trying to go through this life avoiding as much problems as we can. Is not bad, though! But as I always say, all the extremes are bad, and sometimes you just have to go to war. I think as an occidental woman you have the freedom and all the opportunities to be who you want to be even if others don't like it. It is important to appreciate this fact, coz even though it is given to us by default, there's other women in the world that don't have this same privilege. So I don't think we should'nt waste it with a lazy attitude. I think is our "duty" to enjoy our privileges, respect ourselves and don't let others do our thinking. After all, like Audre Lord said: "When we speak we are afraid our words will not be heard or welcomed. But when we are silent, we are still afraid. So it is better to speak." Have a good week you all beautiful women! Dani, this strong 21 y.o "Swiss" in this picture, was one of many inspiring women I met in Maderas beach. When I met her, and her friends I instantly thought "wow, I wish I'd be this rad at my 20's" So full of energy, confidence and wisdom. She already traveled half of the world and started with her sisters a rad clothing line named "Hey Mr. Jellyfish". I'm a fan of these kids! !